The restaurant Apaggio in Mykonos, at Ornos, offers Greek cuisine, in an idyllic setting by the sea. 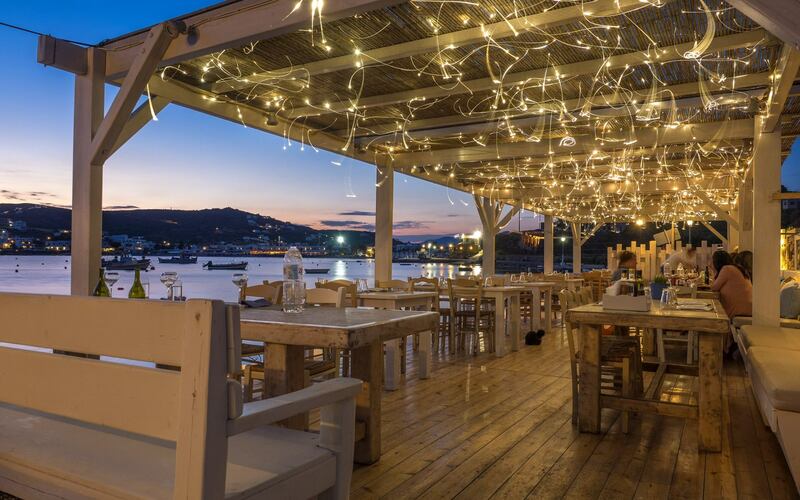 With beautiful decoration, white tables and comfortable sofas, Apaggio is a real shelter to eat delicacies of the sea along with the traditional ouzo or raki. The menu includes fresh fish from Myconos, sea urchins, scallops and octopus. Try fava from Santorini with caramelized onion and capers, salted dumplings with traditional feta cheese and halloumi from Cyprus, sea urchin salad with ouzo rusks and sea rock fennel, homemade small pies with shrimps, grilled crab, salmon and cod ravioli with citrus sauce, risotto with cuttlefish ink and fresh mussels, grilled swordfish, grilled sea bass or beam, many other delicious specialities of the sea and a wide selection of fine meats.